Who does not just love Blue Sky Alpaca Yarn!! To make it even better we have two completed projects using their yarn and patterns. 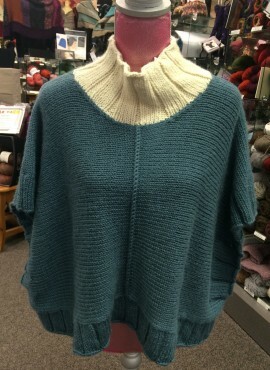 The first project is the Two Harbors Poncho made from their Extra yarn, such a beautiful lofty worsted weight Baby Alpaca and Fine Merino Blend. 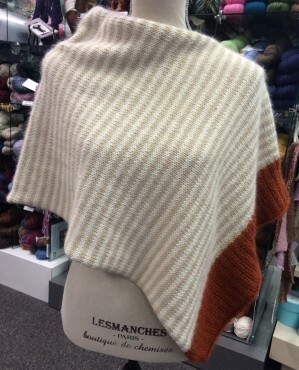 The second Project is the Bianca Wrap made from the Suri Merino yarn which is a lite worsted weight yarn that is made with luxurious Baby Suri Alpaca and Fine Merino giving it the feel of Cashmere and silk. Such a treat to work with these beautiful and fun yarn/projects!!! We have two great projects to Showcase today. Is a great project created by our very own Lori. 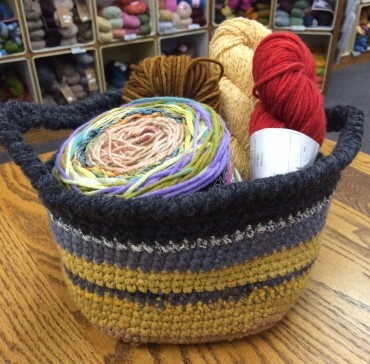 She created this basket with 1 skein of Trio Magic plus ( on of our very our specialty yarns) and approx 100 yards of a contrast color. This basket will be great to keep track of small projects or even as a yarn bowl to prevent those pesky runaway balls of yarn as we are trying to knit and crochet. Yarn and patterns are available thru the store and we would love to help you get started. This is also an Lori Original that we are absolutely addicted to right now. 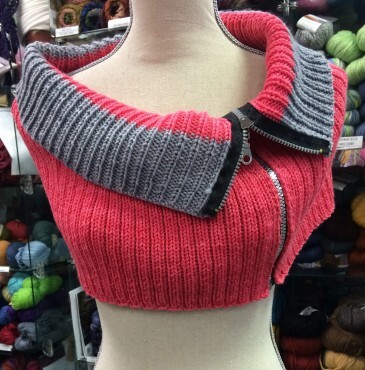 This capelet is created with 2 skeins of Swans Island Worsted Weight yarn. One in each color. This is such a simple yet stylish and sheek way to dress up an outfit. The diversity of the ways to wear it has us craving more!! If your looking for a great project to dress up your white tank, blank legs and cute boots this fall we have the perfect project for you..